This week’s Mastercook challenge was all about creating a yummy buffet for a children’s birthday party. The twist: it needed to be healthy! We wanted our jury of 12 children to enjoy a buffet on which fruit and vegetables are the stars! What did the contestants come up with?! You can watch it here. 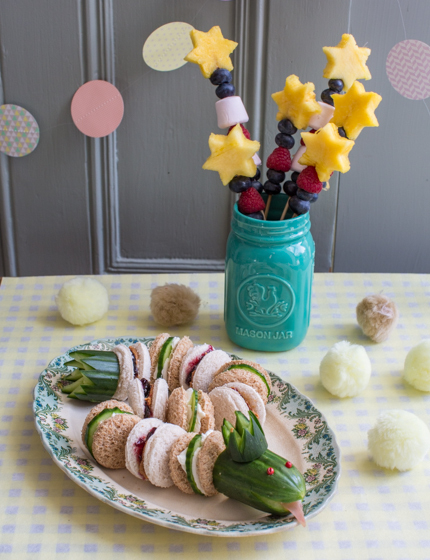 I for myself came up with two easy and cute recipes that are easy to make on the morning of your party: a sandwich snake and fruit star wands. Just cover them in cling film and refrigerate until needed. 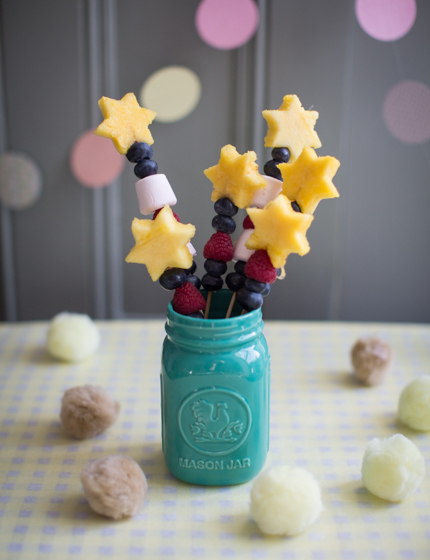 You could also get the kids to prepare the fruit star wands – like that they can thread their favourite fruits onto the skewers. Wash the cucumber and cut 6cm pieces off both ends. Carve a mouth into one of the cucumber ends and place a piece of ham ‘tongue’ into the mouth. Carve two small holes into the cucumber above the mouth and push in the two peppercorns to function as eyes. Cut 2cm off the tip of the remaining cucumber end and carve out some spikes, so that you end up with a crown for the snake’s head. Take the remaining 4cm piece of cucumber end and carve in spikes to form the tail end. For the sandwiches: take a shot glass and cut out two bread circles from each toast slice. Spread some peanut butter onto 10 of the white bread circles, spread some cherry jam onto the remaining 10 white bread circles. Lay the peanut butter covered slices onto the jam-covered slices to form little sandwiches. Cut the remaining cucumber into thin slices. 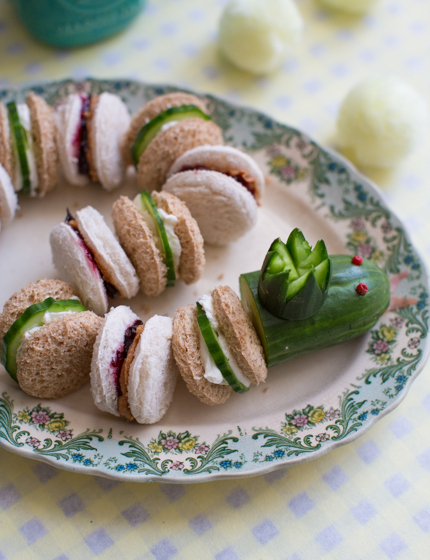 Spread some cream cheese onto each of the brown bread circles, top half of them with a cucumber piece and top with the remaining cream cheese circles to form little sandwiches. 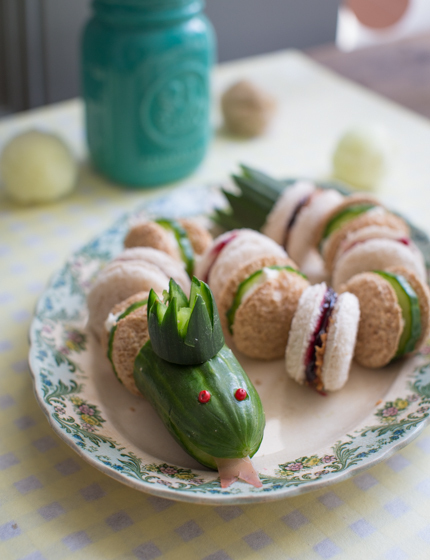 Place the cucumber snake head onto a serving plate. Stick a piece of tooth pick into the cucumber crown and stick the crown into the head. Align the sandwiches behind the snake head so that it forms a snake body, alternating between white and brown sandwiches. Finish off the snake by placing the spiky tail end at the end. Cut the pineapple lengthways into 4, and cut each long pineapple lengthways in half, so that you end up with two thinner pineapple pieces of the same width. Use a star-shaped cookie cutter to cut out 10 stars of the pineapple flesh. Cut the pointy tip from 10 wooden skewers and discard. Thread some blueberries, raspberries and marshmallows onto the skewers and finish off with a pineapple star. 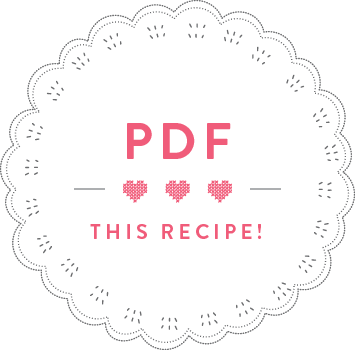 Place in a jar and serve. for children tea with granny.